To encourage students to dream big about solutions to social problems, “Big Ideas@Berkeley” changed the way that campus innovation contests are run. 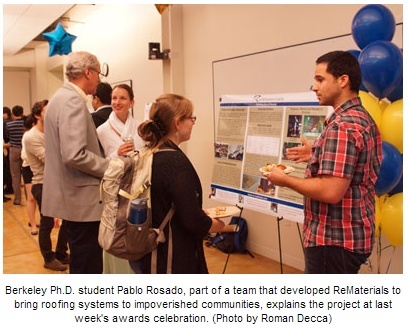 Rather than requiring fully fleshed-out proposals, the Big Ideas competition at University of California, Berkeley invites raw ideas, then provides contestants with assistance to elaborate on them. To reflect the energy of students and the dynamism of the innovation community, Big Ideas launches with enthusiastic campus support and culminates with a public “Pitch Day” when finalists take the mic and deliver their best appeal for extra support. The format has been received with such enthusiasm on the Berkeley campus that HESN supported UC Berkeley in adding three categories of the competition that are open to all HESN-affiliated universities – Global Poverty Alleviation, Promoting Human Rights, and Open Data. This year, of the 187 pre-proposals received, 45 were submitted by student teams from HESN university campuses. Of those, 17 came from Makerere University, one of our leading universities in Uganda. And now, UC Berkeley is offering the format of Big Ideas for free to any campus that wants to hold its own version. UC-Berkeley’s Blum Center for Developing Economies, which began staging Big Ideas in 2009, has compiled its strategies and lessons in managing the event into a free, online Big Ideas Toolkit. “We wanted to develop this toolkit to get down our best practices – from the emails we send to judges, to our reviews of the many contest platforms we’ve explored – so that we can inspire other campuses to develop their own competitions more effectively, and learn from what they create,” said Phillip Denny, Big Ideas program manager and chief administrative officer of the Blum Center. During summer 2014, the HESN-supported Development Impact Lab (DIL) will actively share the toolkit with universities who may be interested in launching competitions or applying the Big Ideas approach to existing competitions. DIL plans to reach out to more than 100 universities including the HESN network, partners, and others in the U.S. and abroad, as well as hosting two webinars, the second of which will take place on August 12 at 10am PST. Make sure to register! Big Ideas is designed to let ideas in rather than keep them out. Applicants are not required to submit final proposals, a level of effort that might deter some with promising ideas. Instead, in order to compete, a student team needs only to submit a “pre-proposal” of five pages’ length. The most promising ideas are designated finalists — about 30% made the cut in 2014 — and then nurtured by the competition organizers. Finalists are paired with mentors from the university, private companies, or nonprofits who assist them for six weeks in turning their ideas into full proposals. The competition organizers hold workshops in proposal-writing, budgeting, and even how to get the most out of your mentor. “What we’re trying to do is create an educational scaffolding for budding social innovators to develop their ideas,” Denny said. Another encouraging aspect is that finalists can win in different categories and levels. Approximately three in four finalists receive funding for their “big ideas,” an average of $5,000 per team, and ongoing support as they implement their projects. Remember to register for the Big Ideas Webinar on Tuesday, August 12, at 10am PST, and join the Big Ideas @ Berkeley team as they share the toolkit, answer questions, and receive input. This article was originally published in the Higher Education Solutions Network’s HESN Connector in July 2014. View the newsletter here.